So when do you know it’s love? The plot of this movie is the simplest anyone can think of. Swapping of roles between wifey and husband. Which is actually sensible unlike the telephone exchange advt of Idea cellular mobile (thu!). Talk about a middle class family in which husband is the bread earner and the wife is a home maker. Kindly note that the term “home-maker” was not used to escape from the sandals which will rain if I say “house-wife”. The wife here is a real home-maker. Due to unavoidable event turns, the swapping of roles happens and the real show starts. what wins is the way her role is etched. Negatives first: Jhansi feels bad that her husband doesn’t shower the same love which he did before their wedding. She gets enraged when he doesn’t treat her like his equal and so she instantly lies about her compensation when he makes fun of her. She wants to get her husband out of his trouble and unknowingly she hurts his ego in the process. There is a friend (Gopal) who she confides in for this and seeks his help to make up for the loss. The most common traits of women (IMO) are that we seek respect along with love, we keep comparing past to the present and there has to be at least one close friend who is their crying pillow and moral support. On the bright side, Jhansi as a wife is desirable. She is pretty, well read, extremely loving and loyal. Playing the husband’s role must have been a cake walk for Dr.Rajendra Prasad given his acting skills. He is one of our few actors who doesn’t have a hate-club. The husband in the film might seem chauvinistic but he cannot be blamed. Though he is egoistic, he is also very affectionate and knows when and how to apologize. Like most men, he is possessive about his wife and the scenes that ensue are supremely cute. He cannot recollect the correct name of Gopal though he can never get him off his mind 🙂 The scenes in which he congratulates Jhansi on her job and the one in which admires that she had treasured all the letters he sent her deserve a special mention. Baapu-Ramana are nothing less than a boon to TFI. I need not explain why. The humor in the movie is laughs-earning not because of Brahmanandam who always gets slapped/fooled by the hero (there is no Brahmanandam in this film. Sorry folks!). It is also not because of some cheap dialogues which indirectly imply some perversion. It is because the dialogues are witty and sarcastic. More importantly, they go with the flow. Neighbor: ఇదే మా అమ్మడైతే కప్పులో కప్పుడిచ్చి గుప్పెట్లో గుప్పుడిచ్చేది. 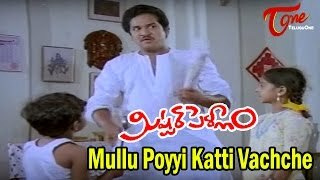 Also the way RJP trolls AVS on Krishnashtami can never be forgotten. After all, అతలు కృష్ణాష్టమి అంటే కిట్టుడి బడ్డే. Keeravani, who if you noticed or failed to notice, can give the most apt back ground music to any scene. The songs in Mr.pellam are melodious and rightly placed if not the best. The famous Krishnashtami song is my most favorite one of the five. The word play relating Krishna’s pranks to Gopal’s actions is very cleverly done. There are scenes in tens which bring a natural smile on viewer’s face and I think that is what makes this movie a delight to watch. My eyes bled when I saw a trailer in which they tried to imitate Pelli pustakam’s title song. I am only praying that some classics are left as-is. Mr.pellam is one such untouchable. Not because it is great, it is right. Just right. Anything that is beyond two standard deviations is significant in statistics.